What comes to your mind when you hear the term, “investment?” Oftentimes, most OFWs would think of it as property since the value appreciates. This explains why many OFWs save to purchase their dream home, no matter how small it would be. Here’s the thing: if you want to buy your dream house, you need to have enough cash to pay for the monthly amortization. Unfortunately, your contract abroad lasts for two years (or three) with a risk of non-renewal. To make sure you can purchase your home, you need to start growing your money and one way to help you with this is by investing in the stock market. 1) Read up and learn everything about the stock market. Most people will say this: “I can’t understand how the stock market works.” Fine, but are you making enough effort to at least understand what stocks are? There are tons of materials available online – articles, Youtube videos, and even blogs dedicated to the stock market. Read up and educate yourself about how it works, techniques and strategies to employ, and the best stocks to buy. Don’t be afraid to ask questions too, because the more informed you are, the better the return will be. Don’t just limit yourself with learning how the stock market works. Keep in mind that everything is related in the financial and economic world. Keep yourself updated about what’s happening in the Philippines because this could affect the prices of every share. 2) Set aside your budget. As a rule, the higher your investment is, the higher the return will be. Nonetheless, you need to consider your earnings since you can’t put all your money in stocks. You can start with as little as P5,000 and add money eventually to grow your investment. The important thing is you should be able to set aside a budget that you are comfortable with. Just make sure you won’t invest all, otherwise, you might not have enough cash for the rainy days. 3) Choose the right stocks. Most people will tell you to invest in blue chip stocks or stocks of big, well-established, and financially-sound companies. In other words, companies that stood the test of time and have been in existence for decades. This includes PLDT, Ayala Corporation, SM Prime, Globe, and San Miguel among others. These companies often give considerate amount of dividends and you are sure that no matter what happens, they will always be standing tall. Does this mean you shouldn’t invest in non-blue chip stocks? Not necessarily. If you are willing to play it out and want to earn something extra, they are worth the risk. Look into the company’s stocks’ history to help you determine when is the right time to invest and how much you should shell out. 4) Always deal with a licensed firm or broker. You cannot directly deposit your investment with Philippine Stock Exchange itself. There are brokers or licensed and legitimate firms that will help you in the trading process. Before you start with your stock market investment, make sure you deal with licensed firms only. Don’t easily believe people who promise higher return in just one week since there is a chance that you are dealing with a fraudster. Check out this list of licensed online brokers by the PSE. Their online facilities allows you to check, buy and sell stocks, and manipulate your investments even if you are working abroad. 5) Treat the stock market as your business. Starting your own business can be difficult and challenging, especially if you are abroad. If you can’t establish your business now, then the stock market can be a good option because it allows you to invest in existing companies. Think of it as a partnership. You invest in a company and in return, you get dividends. If the price of the stocks increase compared to how much you initially bought it, you get something from it and the earnings are all yours. So, are you ready to make that investment? Time Deposit: Is It Worth Investing? We know how important your hard-earned money is. This is why we always encourage you to save and invest as much as you can because you can never work overseas forever. Aside from savings account, one of the most popular products used by many is Time Deposit. The question now is this: is time deposit worth it or you’re better off with other investment products? Read on to find out. But first, what is a time deposit? By definition, a time deposit is a type of investment product that allows you to earn interest over a fixed period or term, usually 30, 60, 90, 120, 180, or 380 days and often higher than your typical savings account. Unlike savings account, you cannot withdraw money from the time deposit. Nonetheless, you are free to withdraw the money, either the entire amount or just the interest earned at the end of the term or renew it for another term (also referred to as roll-over) for higher earnings. Interest rate is higher because the pre-specified length of time allowed banks to use the money for re-lending or re-investment. Maximum length for time deposit is 360 days, although some lenders introduced longer time deposits, some for up to six years. The higher the amount deposited, the higher the interest rate. Apart from peso, you can also open a Time Deposit account in other currency like dollar. Fixed and higher interest rate for the rest of the term. One of the safest types of investment, which is less risky than stocks or property. You can leave it for the rest of the term and you are assured of return and earnings. Interest is paid either by check or deposited straight to your account. You also have the option to re-invest the funds for accumulated earnings and interest. Funds cannot be withdraws until the end of the term. In case of early termination, you will be asked to pay a Pre-Termination Fee. In case you availed of interest payment, interest rate might be affected, often lower than the supposed rate offered. Since the interest rate is fixed, you won’t be able to benefit from the increase in interest rates. Time deposits are not exempt from taxes. 20% final withholding tax on the interest earned and documentary stamp tax will be deducted. Is time deposit the right one for you? The answer is it depends on your financial goals. If you are thinking long-term, say for retirement and you want something less risky, then time deposit can be a good option compared to stocks. You can just withdraw the interest earned and let your money grow. Still, don’t expect bigger return since the rate is dependent on the time deposit amount. If you want to earn more in a short period, then there are other options to consider. 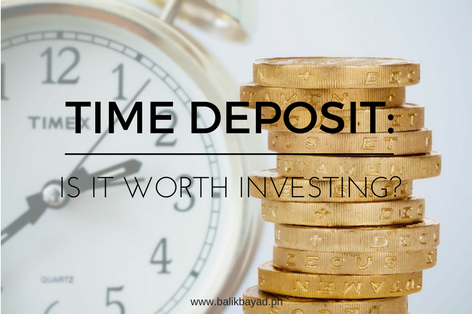 Nonetheless, time deposit can be a good investment, especially if you have cash to spare that you won’t need yet. This could add diversity in your financial portfolio and more importantly, you are sure that your money is safe, sound, and earning. When it comes to savings account, you will always go for the basic Peso deposit account. That’s okay. It is easier and more convenient to open. At the same time, your family needs peso and making money transfer in a peso account is less hassle for them. Most savings account have no maintaining balance. Still, you are required to make a deposit at least once a year to maintain the account itself. That is the beauty of having a foreign currency deposit account. It doesn’t matter how long you haven’t made any deposits. Even if it’s two years or eight, no dormancy fee will be charged. Do you want to preserve your dollar (especially now that the dollar-to-peso exchange rate is high)? Then you can withdraw a portion of your money in peso. There is an option to withdraw in dollar too. The beauty of having a dollar savings account is that you can make it work for you, especially now (as of this writing) that the dollar-to-peso exchange rate is higher. By the time you or your family withdrew money, you already earned something from it. Aside from the “extra” you will earn from the exchange rate, your foreign deposit account will also earn dollars in interest as well. More importantly, this will provide diversity in your savings account and not just limit yourself with peso savings. Keep in mind that dollar is still among the most stable currencies, which you can use anywhere in the world and having one can be beneficial for your financial portfolio. Yes, you can never get away from tax, but your foreign currency deposit account can (although not 100% since there is still final withholding tax). All foreign currency deposits, including interest and other earnings from such deposit is exempt from tax, which is good news. This means more savings for you as well. Coursing remittances on remittance companies instead of banks are more popular and favorable because of the benefits. Nonetheless, money transfer will be easier if you deposit directly to your foreign currency account through telegraphic transfer. This could cut the processing time, making money reach your family faster. 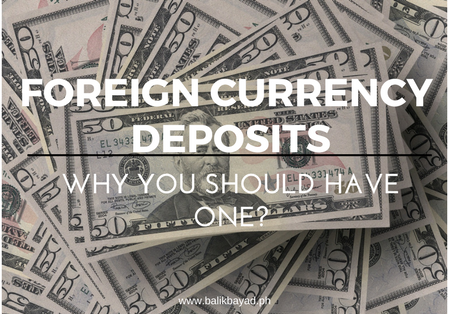 Before you open a foreign currency deposit account, evaluate first the need and importance of having one. 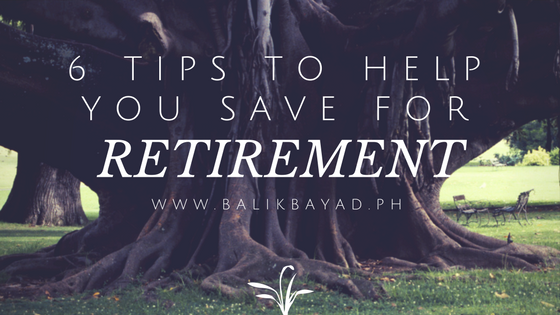 This could be a good move if you plan to use it for retirement, but if the account will be utilized for everyday expenses, then it is more convenient to use a peso savings account. If you plan to open one, BDO, BPI, Metrobank, Security Bank, and other commercial banks offer Third Currency products. They say being an OFW is not forever. That’s true. This is why it is important to strike while the iron is hot and save as much as you can not just for emergency purposes but also for your retirement. “How can I do that?” you might ask. Where to start and how much you should set aside is also a big question. Don’t worry. This post will tell you everything you need to know and do to help you save for your retirement. 1) Two words: Start early. This is the first step in establishing your retirement fund. There is no hard-and-fast rule but to start early and start as soon as you can. The earlier you start, the more you can save. 2) It’s more than just having a savings account. You might think that the only way to establish a retirement fund is by setting aside a certain amount every month and depositing it in a savings account. Apparently, that is not enough. Keep in mind that building a retirement fund is more than just making regular, monthly deposits. Your money won’t grow big, especially if you target millions by the time you retire at 35, which is why you need to invest in other financial products too. Don’t limit yourself with savings account and explore other options such as stocks, mutual fund, or bonds since they yield higher returns. Read more about your investment options here. 3) Set aside an amount and then COMMIT. At this point, you established the many ways on how you can grow your money. You also decided on the investment option to try to boost your retirement fund. The next thing you need to do is to establish how much money you will set aside for your fund and making sure you stick to it. For instance, if you are 30 years old and you want to save one million for your retirement fund, then you should set aside P3,000 every month for 30 years to attain this. It’s not going to be easy since it requires discipline and commitment. It will be challenging at first, but once you start getting used to it, saving for your retirement fund will be a breeze. Remember, consistency and commitment go a long way. 4) Live simply and within your means. Don’t be too complacent just because you are earning in dollars. You will never know what will happen and you need to set aside a portion of your income for retirement, so it is best to always live a simple life and within your means. Pay for the basic necessities and do not spend you money on things that you will not need later on. Before you buy something, ask yourself if you really need it and how long you plan to use it. Think twice before you buy. 5) Take it easy on loans. There are instances when you will need to apply for a loan, especially when you are short of cash. That’s understandable. Before you submit your loan application, evaluate and ask yourself if you really need one. The money you will use to pay for the monthly amortization is better off with your retirement fund. Plus, you don’t want to be buried in debt, do you? 6) Pay off existing debts, if any. Do you want to know another secret to having a bigger retirement fund? Try your best to be debt-free. You will never be able to contribute a big amount in your retirement fund if a portion of your salary is also paying off debts. Therefore, pay any existing debts, whether personal loan, housing loan, or even credit card debts. At the same time, avoid incurring further debts. If you can’t afford a new car yet or a vacation with the family, then delay them for now. It will be easier for you to grow your money if you are debt-free. With these tips in mind, are you ready to put up your retirement fund? When it comes to retirement fund, you would often think of a savings account or your contributions in SSS. You may also rely on your insurance or investment plans, although it may take some time before you get the proceeds. In that case, you might want to consider opening PERA. You might ask, what is PERA and how does it differ from other retirement funds? Read on to find out. PERA stands for Personal Equity and Retirement Account. Sometime in 2008, Republic Act 9505 or PERA Act of 2008 was passed to promote savings mobilization and capital market development in the Philippines. It is also a voluntary retirement savings plan, which you can have in addition to your SSS or GSIS. More importantly, this will benefit, you and other OFWs who are unable to contribute to SSS or GSIS but still need to establish a retirement fund. You can open to up to five (5) PERA accounts, but it must be under one administrator. Anyone with Tax Identification Number or TIN and stable income can open PERA. Even OFWs who are still abroad can open savings or investment account with through your legal spouse or child. If your spouse will open an account in your behalf, submit a Marriage Certificate, Sworn Certificate attesting spouse to transact on your behalf, and supporting documents showing your OFW status. If your child will open an account in your behalf, submit Birth Certificate, Sworn Certificate attesting your child will open an account in your behalf, and supporting documents proving your OFW status. Every year, you are allowed to put up to P200,000 every year. For non-OFWs, a maximum of P100,000 is allowed. Nonetheless, make sure to ask the bank where you plan to open an account regarding the minimum amount in opening an account. The purpose of this facility is for long-term use. To maximize the benefits of this account, it is best to withdraw your money by the time you reach 55 years old and meeting the required number of contributions (it’s five). Your money grows tax-free since the account is exempt from income tax, withholding tax, capital gains tax, and 10 percent cash received from corporations. Any withdrawals made by the time you turned 55 and onwards cannot be taxed as long as you made consecutive contributions for at least five years. PERA is not part of your assets, which means it cannot be taken by creditors or dissolved in case you declare bankruptcy. The employer can contribute on the fund as long as the amount is within the annual limit. Don’t get too excited. Despite the benefits, applying for this type of facility is intended for your retirement plan. This means you cannot withdraw early, otherwise, you will pay a penalty fee. On the other hand, in case you withdraw due to cover the expenses of an accident, illness-related hospitalization of at least 30 days, or total permanent disability, no penalty fee will be charged. At present, only BPI and BDO were accredited by the Bangko Sentral ng Pilipinas as PERA Institutional Administrator. Time and again, people will always tell you, “Mag-invest ka! Sayang kinikita mo.” That’s true. Earning in dollars allows you to save more than what you can save here, which is why you need to take advantage of the opportunity. You might say that you have no idea what investments are or how the stock market works. You’re not even sure if you are equipped to invest. You might even ask how and where to start investing. It’s a good thing you stumbled upon this post because this will give you a guide to make you start investing. 1) Always start with a short and long-term goals. When do you plan to get a new car? How about a new house for your family? How soon do you want to start with your mini grocery business? Whatever it is, the first step in investing is to set your goals, both short-term and long-term goals. This will serve as your guide in choosing what type of investment you should go for. At the same time, you have a timeframe that will act as your guide on what to accomplish on the specified date. 2) Explore your investment options. Now that you established your goals, it is time to look into the different investment options you can try. Most OFWs invest in a house or car first, only to end up swimming in pool of debt because they are unable to keep up with the monthly amortization. The opportunities are limitless. You can start with mutual funds or UITF if you prefer earning a little while being safe. These are managed by bank experts so you get to grow your money without risking too much. Stock market or government bonds are also excellent choices to grow your money. If budget already allows, real estate or putting up your own business can help a lot, although this should be your last resort because of the risks involved. The point is educate yourself about the investments available before you say yes to one. 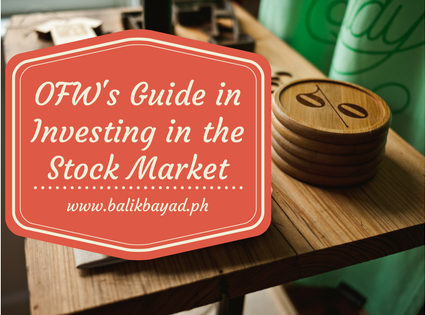 Check out this post to learn about the different investment options available for OFWs. 3) Set budget aside, depending on how much you are willing to risk. You have your eyes set on a particular investment option and that’s good. The next step is to set aside a portion of your monthly income to be able to fund your investment and taking into consideration the remittance and daily expenses you have to pay for. Stick to it and you will reap the rewards of your investment in no time. Bonus: This Financial Planner from the Bangko Sentral ng Pilipinas can be helpful in establishing your budget. You may access it here. The good thing about investing today is that there are tons of information available online that allows you to better understand investment. Read up and educate yourself about various ways to grow your money. Still, don’t limit it there. While you’re back home, consider attending financial education seminars for you to be better equipped about investments, especially when it comes to risks. The more educated you are, the better you will be in making decisions and identifying what is best for you. 5) Stop spending and start investing. Most OFWs have the habit of spending money on material things so that they can send something back home. Even if the items cost less than how much they are priced here, you are still throwing away the potential of growing your money. To start investing, you need to stop spending. Splurge once in a while, but don’t allocate your entire monthly salary for remittance and pasalubong. Your money won’t grow if you won’t start sowing them. It doesn’t matter if you invested hundreds of thousands or P5,000. What matters most is that you start early using the investment option that suits you best. After all, every peso counts in every OFW’s life. Be ahead of the rest. As an OFW, you have the privilege to earn in dollars and earn more than what you can earn here. Still, don’t be complacent. With the rising expenses back home and in the country where you work, it’s not surprising if your monthly salary is unable to cover all of your expenses (including shopping, perhaps). At this point, you might want to consider looking for an extra work for extra income. You have two options here: you can try buying and selling goods from the Philippines to the country you are in or ship and sell items to from where you are to the Philippines. The good thing about this business venture is that the possibilities are endless. The market for local products is big because Filipinos will always love the taste of “home.” It could range from native delicacies to toiletries or even food products. If you are on a vacation, fill your suitcase with local goods then sell it as soon as you’re abroad. On the other hand, there is also a big market back home where Filipinos want to buy something from abroad that is not available here then send it back home. In short, you sideline as a shopper. Maximize the opportunity and put up your online store or Facebook page to make it easier for your potential customers to contact you. Are you thinking of making use of your downtime? If you have time, consider working freelance like being a babysitter, chaffeur or driver, or an English tutor. If you can bake or cook, use those skills and offer your services at an affordable price. It will definitely give you additional income while working abroad. Did you know that blogging can give you a lot of income opportunities? It will take time, but with the right tools and techniques, you can make money from blogging. The key here is to choose a topic you are passionate about, say your life as an OFW. This will make it easier for you to write and reach your target audience. Just make sure to update it regularly. Believe it or not, more OFW prefer communicating with their loved ones through call and text. It is easier, faster, accessible, and more convenient than waiting for a decent Internet connection. At the same time, some services such as transferring funds or mobile entertainment requires load. Since there most Filipinos own a cellphone, take advantage of that by putting up your own loading station. It won’t make you a millionaire, but it will definitely help in giving you additional income. Do you have extra space in your house or unit? You might want to try renting the space – or even a bedspace – to fellow OFWs who are in need of a decent place to stay. This could give you additional income, which you can use for equally important expenses or to help you set up your emergency fund. These business ideas may not yield millions during the first six months, but it will definitely help you a lot in boosting your savings or giving you something extra in case something happened. Just be patient and committed and who knows, the income you will get from these “small businesses” could lead to something bigger, saying getting your own franchise of a food cart or even in real estate. 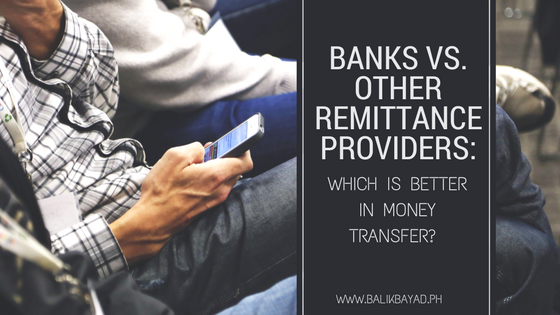 Banks vs. Other Remittance Providers: Which is Better in Money Transfer? Sending money to their respective families in the Philippines will always be part of being an Overseas Filipino Worker. In fact, this is among the biggest considerations why you sought greener pastures. With hundreds of thousands of OFWs, it’s no surprise that banks decided to offer services specifically for OFWs, which includes remittance facility. Let’s say you don’t have sufficient requirements that will meet the criteria set forth by banks to open an account. You seek help from money transfer companies who require less rigid requirements to be able to send money back home. Here’s the question: which is better when it comes to money transfer – banks with tried and tested reputation or remittance providers who are more convenient and affordable? Read on to find out. 1) Banks need more information. Did you know that not all banks have online wire transfer services? If you plan to remit money through wire transfer, you may be asked to fill out forms to facilitate every transaction. An ID is also required to validate your identity. You can skip this if you opt for remittance providers. 2) An account is required to allow remittances through banks. Various banks have Savings Account facilities specifically for OFWs. You can use this account not just for savings but also to transfer money in the Philippines. On the other hand, you cannot avail of this service from banks if you don’t have an account with them. At the same time, banks only transfer to other banks as the receiving end. Bank transfer is safer, but if you don’t have an account with them, you will have to look into other options such as MoneyGram, Xoom, or Western Union. They allow you to remit money back home even without any form of membership. 3) Remittance providers send money faster than banks. If your family back home is in need of money and you want to send it immediately, then you might consider remittance providers. Bank wire transfers take longer to reach the recipient. Alternatively, there are remittance providers like Western Union that allow the recipient to receive the money in minutes. 4) When it comes to smaller transactions, remittance providers are more beneficial. If you need to send small amount of money overseas, then remittance providers like Xoom and Western Union can be your best option. You can also avail of bank’s remittance facilities (if you have an account with them), although the exchange rate may be higher. What if you need to send large amount of money back home? Bank transfer can be an option since it is safer. Nonetheless, you might also want to consider Forex companies since they offer favorable exchange rates at limited to zero costs. At the same time, the higher amount you send, the better the exchange rate will be. 5) Remittance providers have lower exchange rate. Remittance providers can be more convenient; however, the exchange rate is generally lower compared to banks. With these factors in mind, what do you think is the best way to send money back home? The answer is it depends on your needs. If you have an account with a bank that offers remittance facility, then maximize it. If you want to send money transfer, then remittance providers can be your best option, although the remittance fees and currency conversion costs are generally higher. 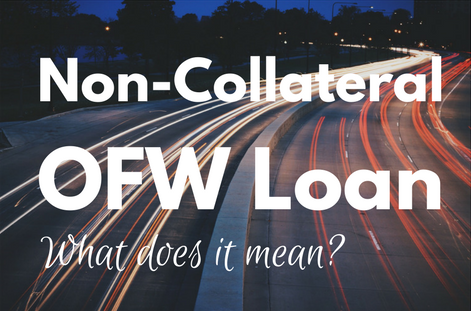 Non-Collateral OFW Loan: What Does It Really Mean? There are two types of loan in terms of security: collateral or non-collateral loan. Collateral loan means the loan is guaranteed by a security, which could be in the form of real estate, chattel, time deposits, or goods. On the other hand, Non-collateral loan is not backed up by any form of security. Between the two, lenders prefer collateral loan. This gives them an assurance that whatever happens, they will be repaid since an asset is tied on the loan. Here comes the tricky part: not all OFWs have property or any form of asset that they can use as collateral. What’s your next option? You can apply with a co-maker or co-borrower. 1) It is a low-risk option than secured loans. Imagine getting your car or house re-possessed just because you are unable to pay a loan. Stressful, don’t you think? This won’t happen when you apply for a non-collateral loan. It is a low-risk option because your assets are not compromised. Nonetheless, it may take a while for banks to approve your loan since they will need to conduct verification procedures to make sure they can extend credit to you safely. 2) Requirements are easier to comply with. You don’t need to submit Tax Declaration, original title of the property, tax receipts, or sign any documents to guarantee your loan. In fact, non-collateral OFW Loan calls for requirements that are easier to comply with such as Proof of Income and billing address to verify where you live. Since they are easier to comply with, you can submit it anytime and it won’t compromise the length of loan application process. 3) A quick solution to your cash needs. There are cases when you will need cash and be able to pay it in less than a year. In that case, a non-collateral loan can be your good option. It is easier and faster to process without compromising your finances or savings. Despite these benefits, keep in mind that non-collateral loan usually have higher interest rate because of higher risk of non-payment. The good news is there are lenders like Balikbayad that offers competitive rates and easier repayment options to make it less stressful for you. Give us a call or send us a message to know more about what we can offer. We love to help you with your cash needs. Are you a seaman who is in need of cash? Do you need money to finance the purchase of a car or to help you put up your own business? Then there is good news for you. Apart from the usual OFW Loan, many lenders also offer Seaman Loan exclusively for seafarers like you. Seaman Loan is a type of financing option specifically designed for seamen and their families. Similar to other types of loan, a Seafarer’s Loan requires qualifications before you get approved. 1) Complete all the requirements needed. Lenders deal with tons of applications everyday. They have to go through every set submitted to check if the requirements are complete and endorse the application for approval. If you are unable to submit a complete set of requirements, lenders will less likely prioritize your application. Before you submit an application form, make sure that you have all the requirements needed, which includes birth certificate and government-issued IDs. If you want faster approval, don’t forget to provide documents that will show your capacity to pay such as Fleet Manager’s Recommendation or Joining Date Disclosure. 2) Prove your salary status. Lenders are not willing to extend credit to everyone, most especially to those who are not capable of paying back a loan. To speed up your Seaman’s Loan approval, make sure that you are able to prove your capacity to pay by showing your salary status. There is a reason why lenders, regardless if you are borrowing from the government, commercial banks, or private lenders, ask for your Certificate of Employment or Overseas Employment Contract every time you apply for a loan. They need to know the status of your employment and when you are coming back. Many OFWs think that just because you are abroad for two years (or more, depending on your contract), it will be harder for lenders to go after you. If they see that your employment is unsecured, they are less likely to extend credit. What kind of dates should you provide? The Joining Date Disclosure, which you can get from your Fleet Manager, and Departure Date. These two will show lenders that you have a secured job and salary to pay for the loan. 4) Prove your residence status. Do you know why lenders have soft spot on collateral loans? It is a form of assurance for them of your intention to return to the Philippines once your contract expires. If you want to speed up your application and increase the chances of approval, secure your residence status through home ownership or use one of your properties as a mortgage for the loan. What if you don’t have your own home yet? If you are living with your parents or relatives or have an ancestral home (don’t worry, it doesn’t have to be big), then you can use that to prove your residence status as well. Otherwise, you can try the next tip. 5) Apply with a co-borrower. A co-borrower is common on non-collateral loan and whose role is to pay for the monthly amortization of the loan in case you failed to pay. Lenders understand that not all OFWs have properties to help secure the loan. In that case, you can apply with a co-borrower since it also serves as an assurance that lenders can go after someone in case you missed a payment. Do you want to make loan application easier for you? Then Balikbayad might be of help. Give us a call or send us a message and let’s talk about how we can help each other.